The father of Brazilian historiography, Vicente do Salvador, once compared the Portuguese to crabs: neither left the coast. 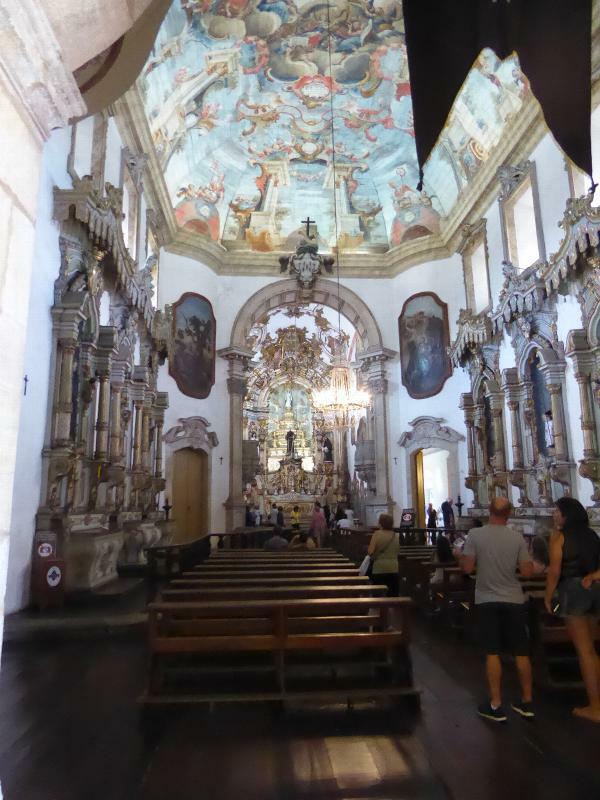 Vicente died in 1636, and it was another 40 years before a Portuguese king asked someone--Fernão Dias Pais--to explore the interior and find some gold. 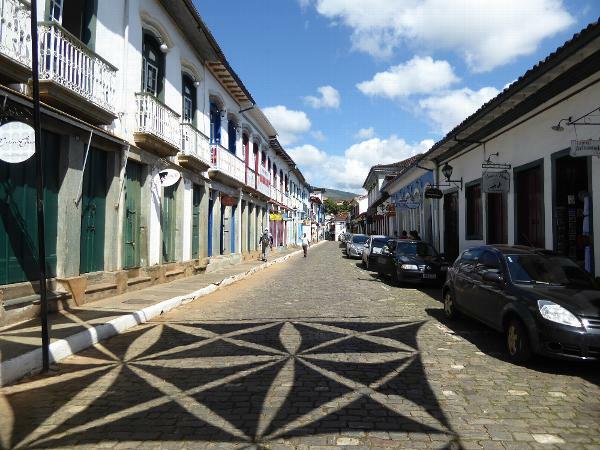 Pais failed, but success came 20 years later in an area now within the state of Minas Gerais. The Crown was delighted--times weren't good back home--and it did what all right-thinking governments do under the circumstances. 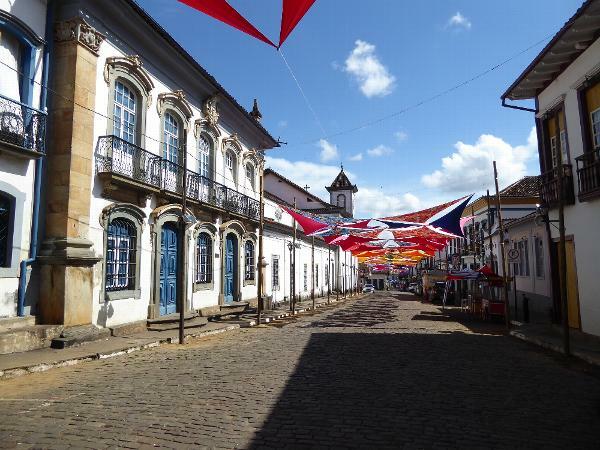 It banned education, prohibited printing presses, and threatened all foreigners who ventured to Minas with enslavement. This was much more effective than a "Keep Out" sign, and it was not until 1809 that an Englishman, John Mawe, set off, as he wrote, "on a journey which no Englishman had ever before undertaken." 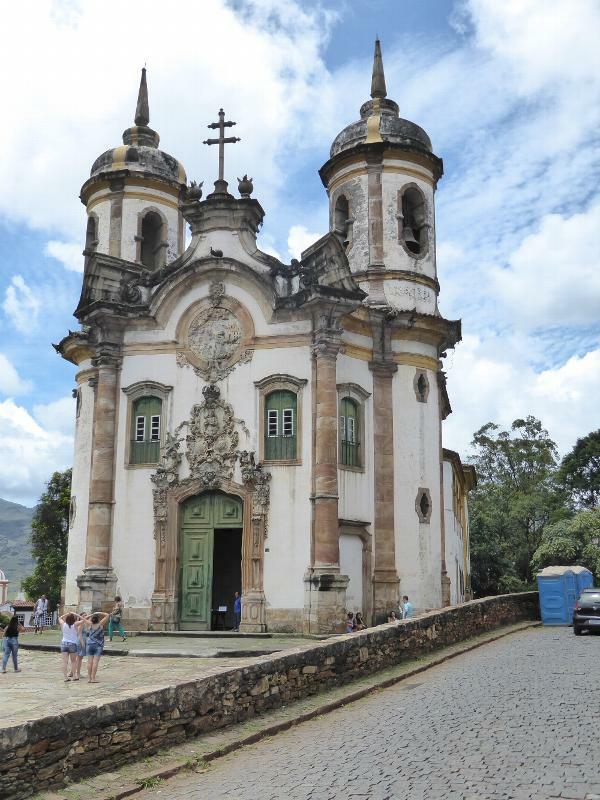 See Robert Chester Smith, "The Colonial Architecture of Minas Gerais in Brazil," The Art Bulletin, 21:2, 1939, p. 113. 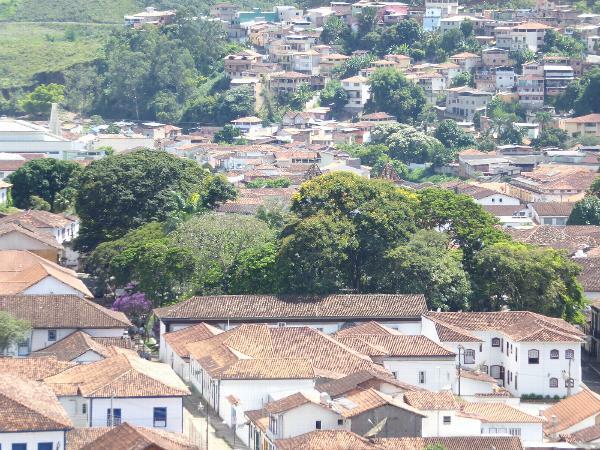 Since 1893 the capital of Minas Gerais has been Belo Horizonte, a very large city today that, like Brasilia a lifetime later, was created in the back of beyond. 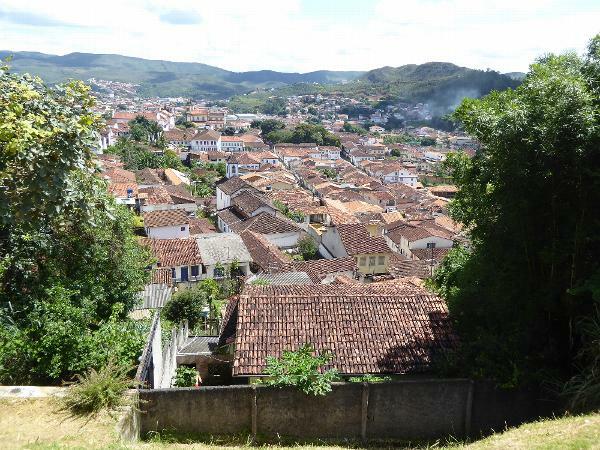 Belo itself replaced Ouro Preto ("Black Gold"), which had been the capital since 1720. 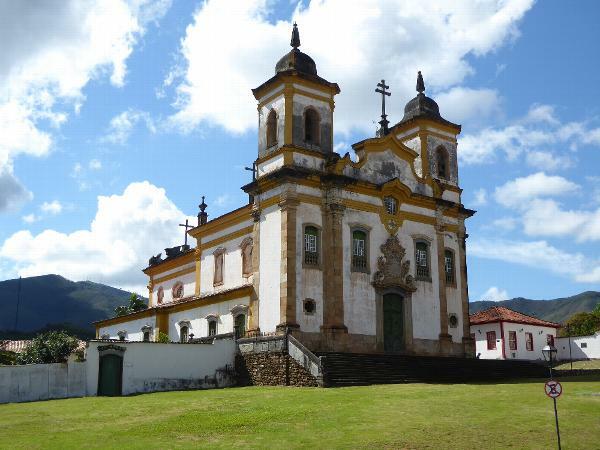 Minas had an earlier capital still: it was Mariana, about 10 miles east of Ouro Preto. Mariana was named for an Austrian princess, Marianna of Habsburg, who had married the king of Portugal. 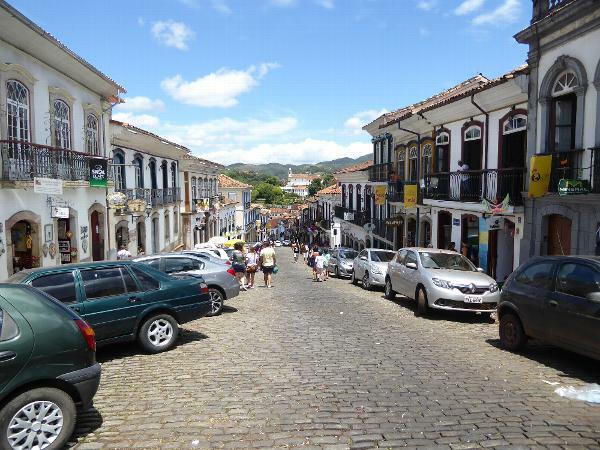 Today, Mariana is a much quieter place than Ouro Preto, let along Belo Horizonte. Mining still goes on, but it's out of sight to the north and is now for iron, not gold. This is very big business, and in 2016 it hit the international news media when a dam holding a waste pond breached and destroyed a downstream village. 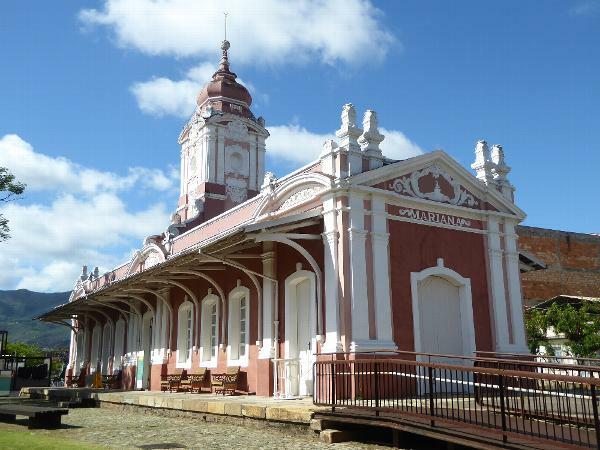 To serve those mines, a railway arrived about a hundred years ago: the Mariana station, shown here, opened then, in 1914. 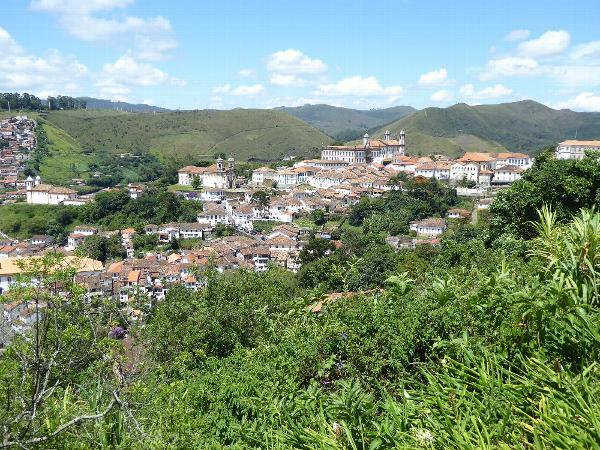 It still supports a tourist train running to Ouro Preto. The 10-mile journey had in the early days taken four days "because of the huge woods which barred the certainty and brevity of the way...."
See Charles Boxer, The Golden Age of Brazil, 1695-1750, 1962, p. 27. 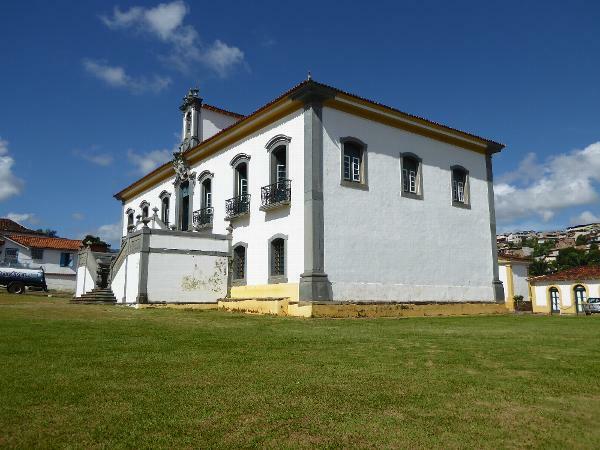 Here's Mariana's town hall and prison (the casa de câmara e cadeia). 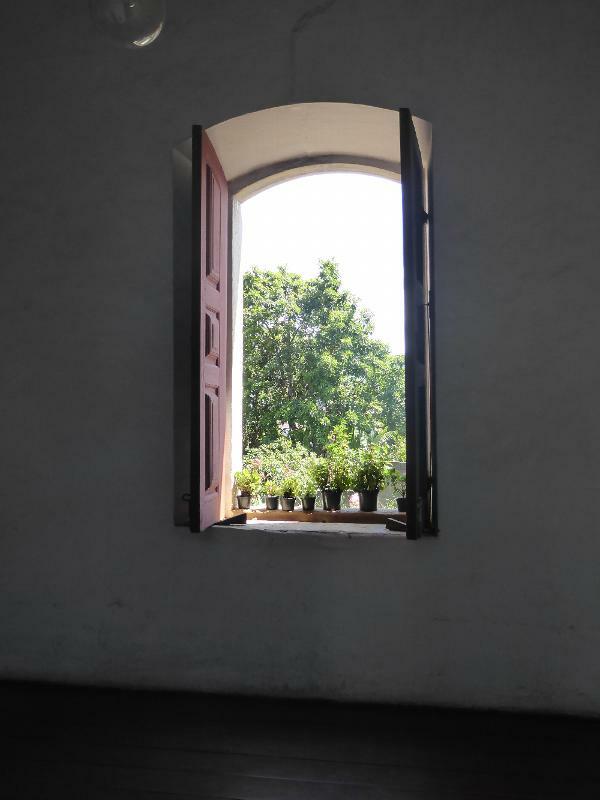 The prison was downstairs and was thoughtfully provided with windows through which the condemned could beg for food. (They were good at it, or they died, because the prison authorities provided no food. In the early prisons, the cells had no conventional doors, either, just trap doors.) 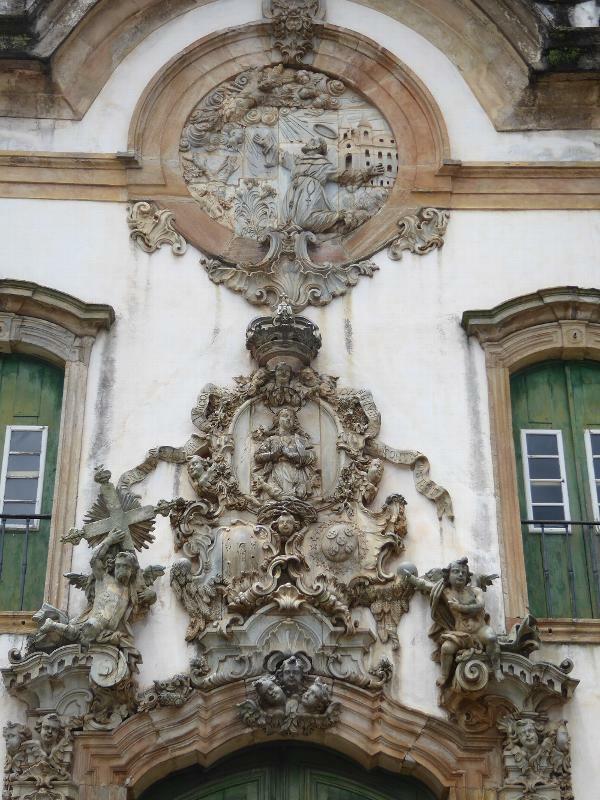 More fortunate townsfolk entered upstairs and under an elaborate doorway ornamented with the Portuguese king's shield. The town hall faces this plaza. 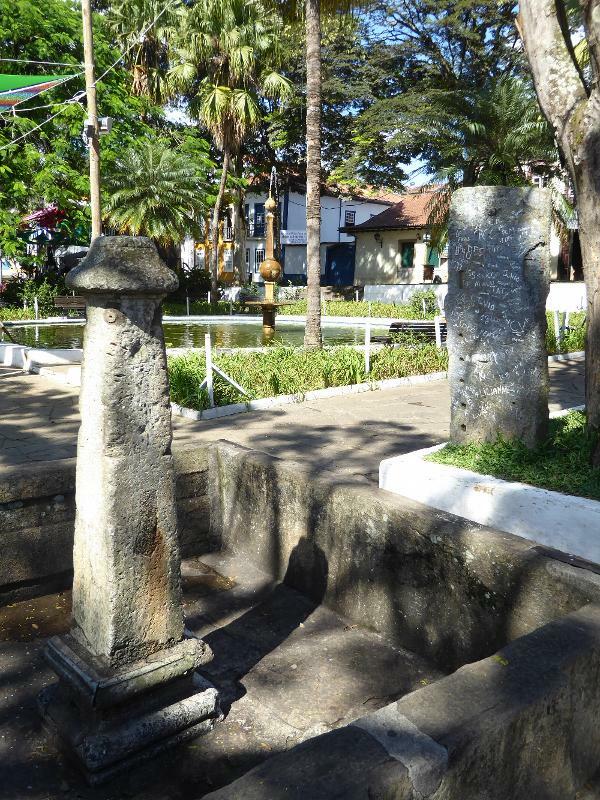 The easy-to-ignore column is one of Brazil's two surviving whipping posts, the pelourinhos or pillories of genteel speech. The competing churches are, on the left, the church of Saint Francis and, on the right, the church of Our Lady of Carmel. 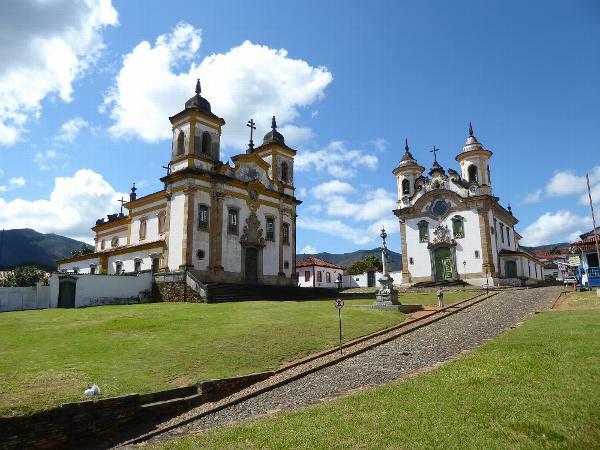 As part of the police-state protocol, neither the Franciscans nor the Carmelites were permitted to enter Minas Gerais; after all, like the Jesuits they might object to slavery. Instead, these churches were built by Third Order Franciscans and Carmelites, that is to say by ordinary citizens at least nominally in sympathy with Christian ideals and in any case socially bound to join one order or another. The churches are fancy because the Third Orders had lots of wealthy members. Alas, on the day of this picture, both churches were locked up. Was the architect innovative? Not very. 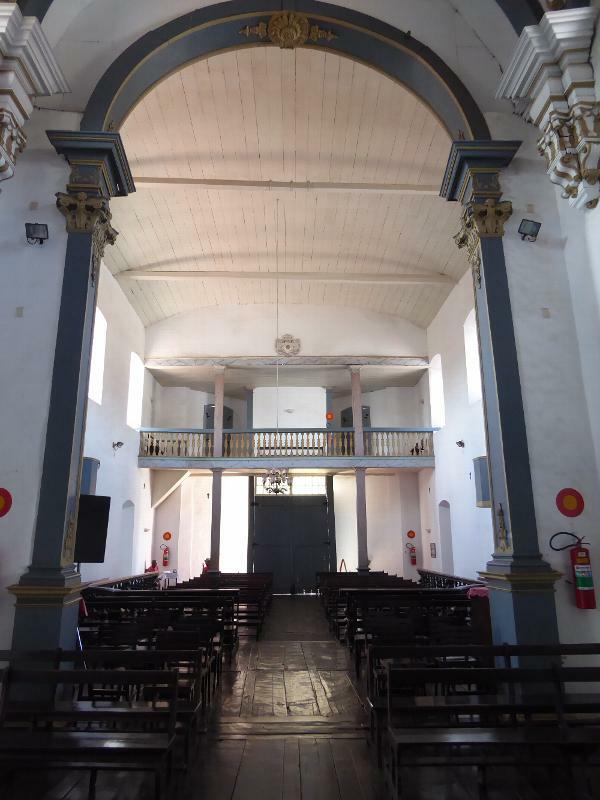 Smith writes that the architects of Minas copied the churches of northern Portugal with minimal deviation. The Carmelites gave their church a narrower facade but made their twin towers into turrets, increased the trim budget, and adhered to the tradition of one door under three windows--two rectangular and one round. Hmm: do you suppose that there's significance in the number three? We're heading down the street that separates the two churches. That's an elaborate fountain on the right, from back in the days before water came in wretched plastic bottles. We've come to the town square. How did it look in 1700? Good question. It was (and is) rimmed with old townhouses, though the elite no longer occupy them. Horses had to be watered. Slaves as well? Wouldn't come as a surprise. We've made a left turn at the square and are heading down toward the cathedral. You can see one of its towers. That building on the left wants a closer look. Now it's the Sacred Art Museum, but it was a chapter house for meetings of the cathedral canons. Its completion date is unclear, though records show that the canons in 1793 sued the contractor for having not yet finished the building even though a contract for it has been signed in 1770. (There's nothing new under the sun.) The Archdiocese took over the building in 1926, and it became a museum in 1962. But do you like it? 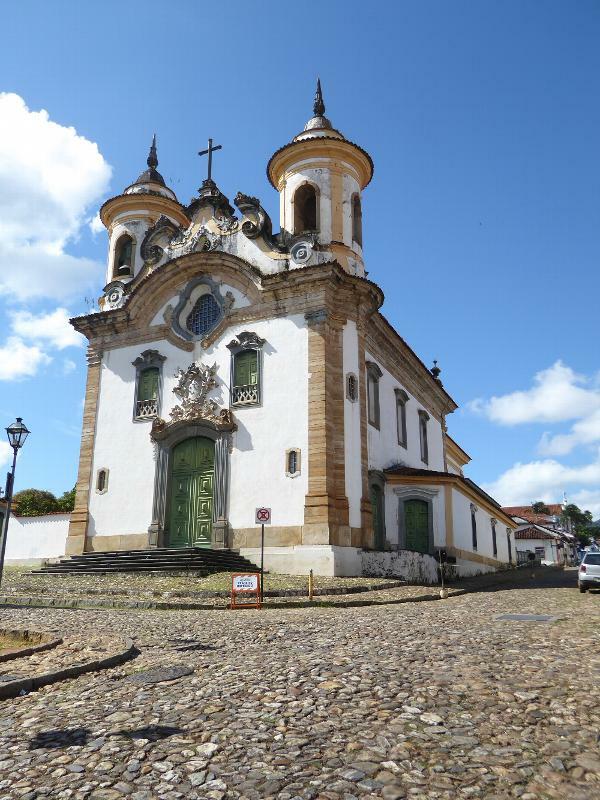 It's easy to get overwhelmed with information, not to mention fatigue, but one renowned critic, Germain Bazin, calls this "one of the most elegant rococo buildings in Brazil." And here's the surprisingly modest cathedral. Well, modesty became the Jesuits. Besides, they built it as a simple parish church. 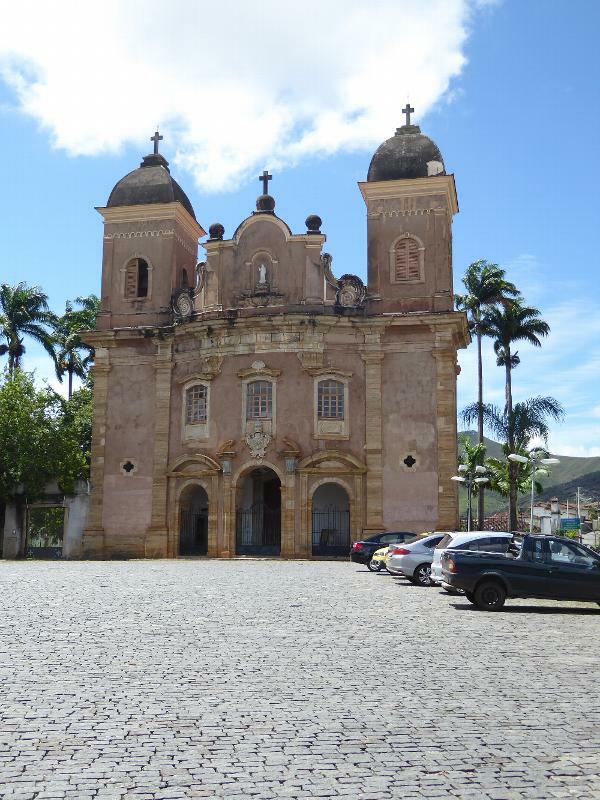 Minas got a bishop in 1745, however, and this demanded upgrades. They're inside. We can see them because, mirabile dictu, we've stumbled upon a church that's actually open. See the modification? Not yet, or not very well. Surprised that there's no marble? Get used to wood in this part of Brazil. Here's Bazin again: "As the church became a cathedral to house the bishop's seat, the temple had to be richer. 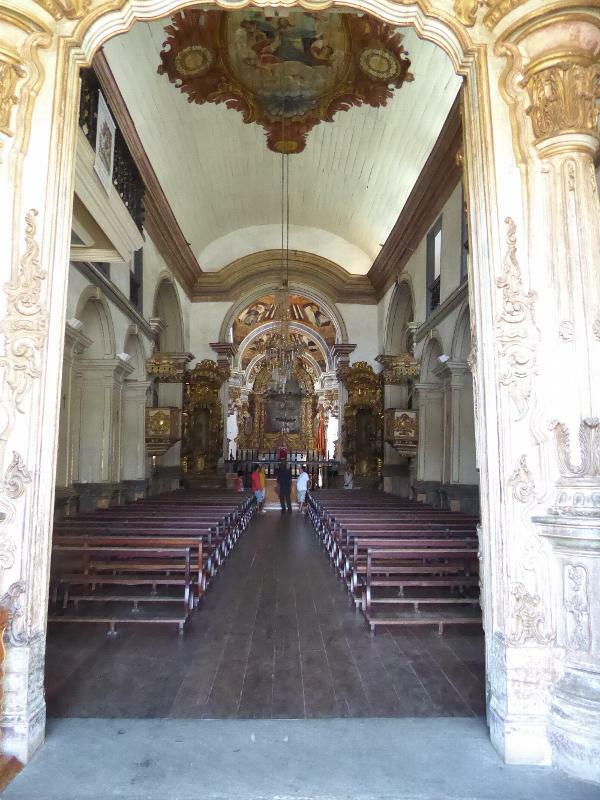 Thus, the main chapel was divided into two parts by two consoles of a composite order that support the pendants from two cupolas of slight relief, in wood. 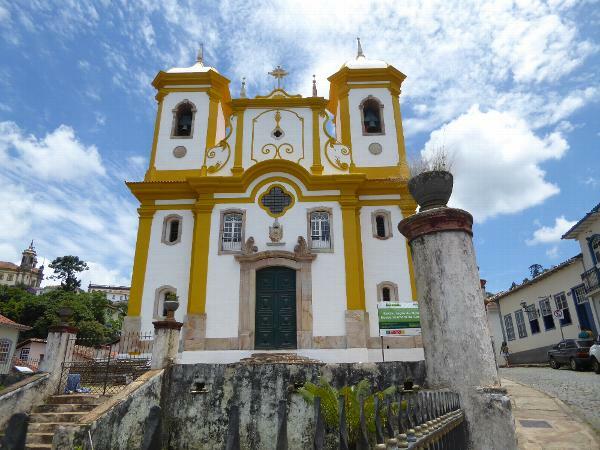 On these two cupolas, an architectonic decoration was painted that houses two times four saintly priests." The painter was Manuel Rebelo e Sousa. 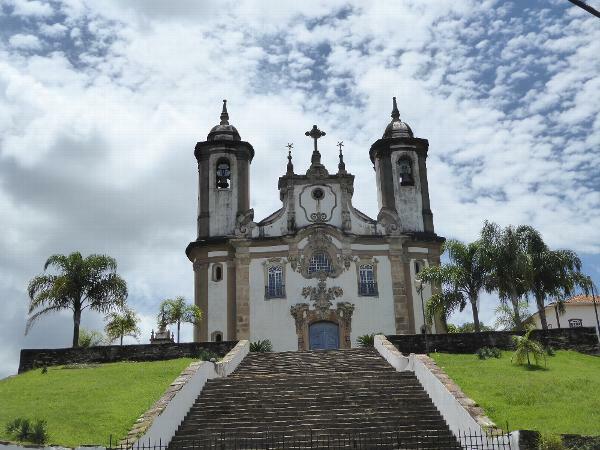 True domes don't exist in Minas, however. "Instead wooden roofs were constructed to simulate cloister vaults or even shallow interior oval domes." Another modification: the church got an organ. Organ-lovers alert: this was not an ordinary organ but one built by Arp Schnitger and given by King John V as a present to the bishop of Mariana. We've come back up to the town square and will walk past those townhouses and up the street. A block farther and property values have declined; we're down to one-story. Up in the distance is the church of Saint Peter the Cleric. Before we get there, and off to the right a block, there's a simpler church, with a single tower. It's probably Our Lady of Saint Anne. 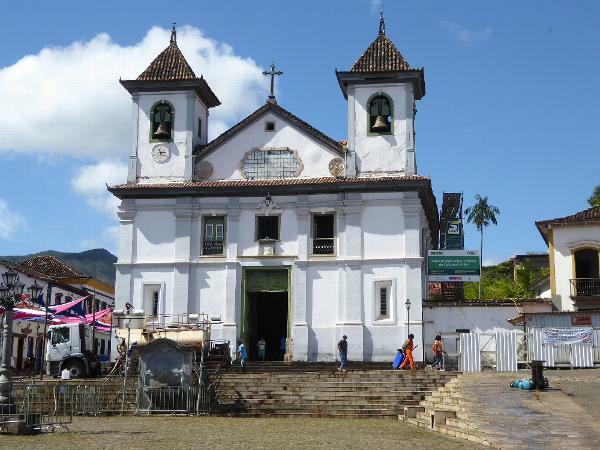 It's another reminder that no Minas church has any marble; there was none to be had in the mountains here, and importing it from Portugal was impossible. Fancy churches could and did gild wood, but not ones like this. Natural air-conditioning. Think you can hear anything? Negative, captain. What extra money the builders had went to the altar, customarily shaped as a triumphal arch. The view back down toward the Carmelite church. On the right is a boarding school established in 1849 by the Daughters of Charity of Saint Vincent de Paul. Since 1972, the Providencia Hotel has occupied the front wing, with profits helping fund what is now the Providencia College. We've gone up to St Peter of the Clerics, which is very late, with work begun in 1753 and stopped in 1820. The towers came a century later. It's closed, of course, but we're here for the view anyway. You can see the Franciscan and Carmelite churches in the left background, and you can see the trees of the town square. Here's that same town square, this time zoomed enough that you can just make out, above the trees on the right, the twin pyramids atop the towers of the cathedral. Big jump, please: we've moved ten miles to the west. 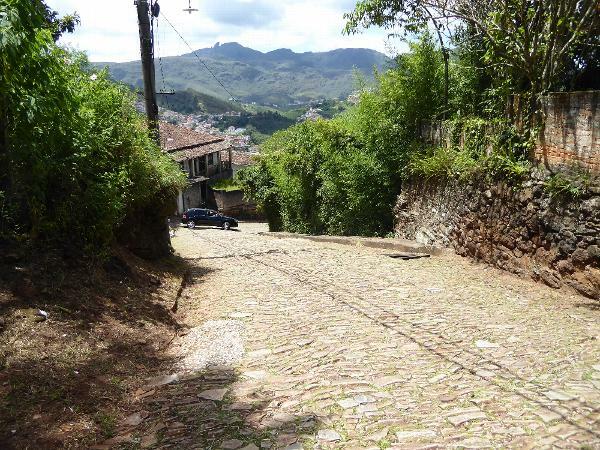 This is the road coming into Ouro Preto from Mariana. 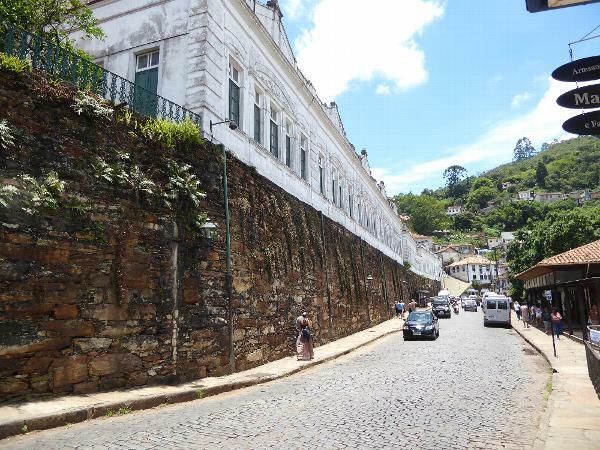 The building on the left sits atop a wall that used to support the palace of the governor of Minas Gerais. 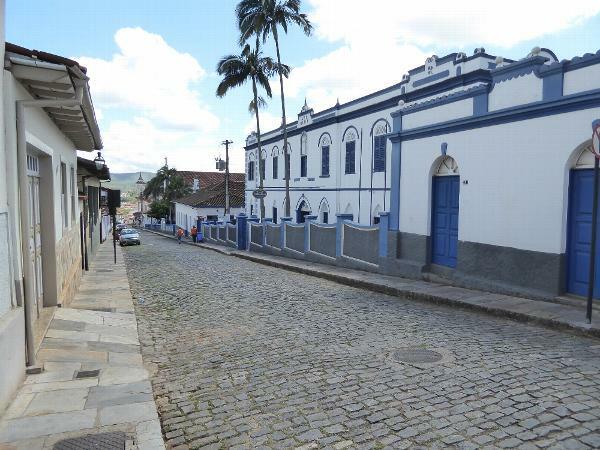 He departed with the shift of the capital to Belo Horizonte, and the site found a new use as a school of mining. 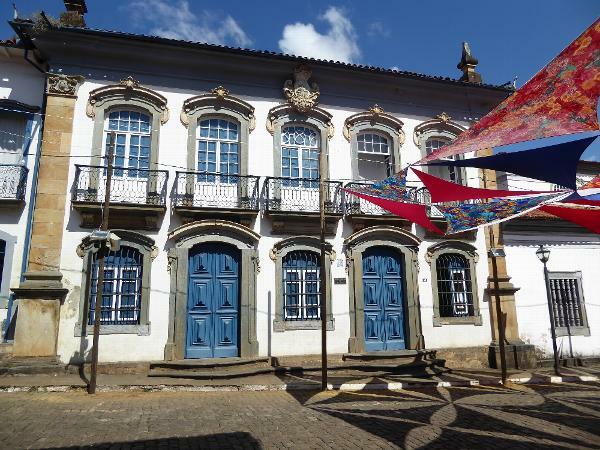 It's now part of the Federal University of Ouro Preto. 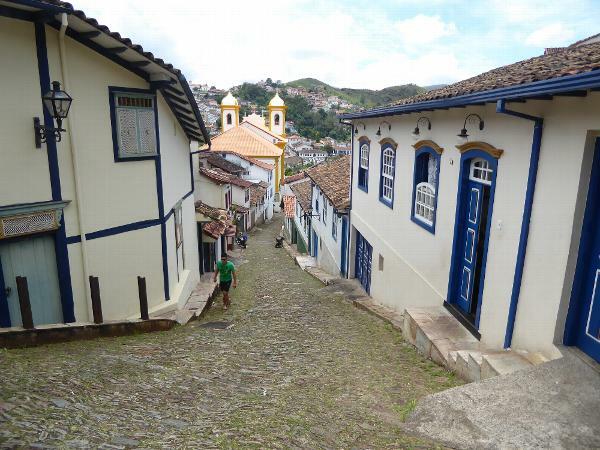 We'll climb up a local street to get an overview. This is the Ladeira (or slope of) João de Paiva. Not bad. The church left of center is Saint Francis. The paired buildings right of center are the old town hall with its prison and, with two towers facing right, the Carmelite church. 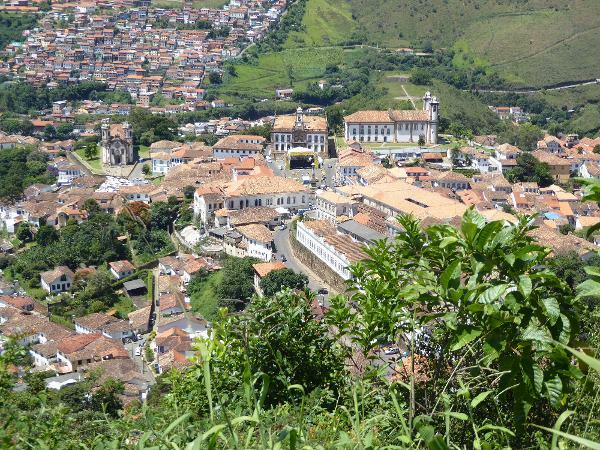 Ouro Preto is intact mostly because it was sidetracked when the capital moved to Belo Horizonte. Since the 1930s the town has been a national monument, and since the 1950s traffic has been diverted by a circumferential highway. Even the bus terminal is on the outskirts. UNESCO put the place on its World Heritage List in 1986, which means of course that you really need that beltway to help manage the crowds. Tighter focus. In the lower center you can see the wall of the governor's palace, as well as the school buildings that have grown on top of it. You can also see the plaza stretching to the Town Hall. (A tent has been set up in front of it: Carnival prep.) 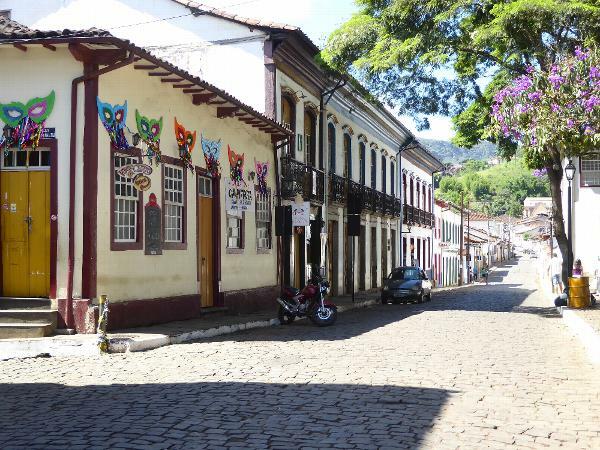 In the center of the square is the column memorializing Tiradentes, a national icon and martyr to Brazilian independence. 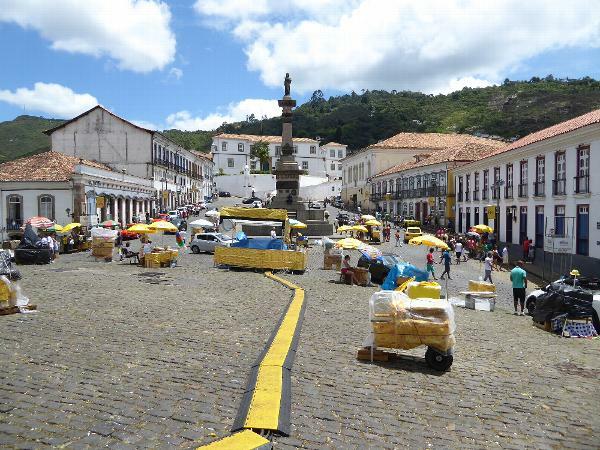 All in all, this plaza with a couple of streets radiating perpendicularly is as close as the Portuguese came to giving Ouro Preto a Spanish-style grid. Blame the topography or maybe the Portuguese themselves, not quite as compulsive as their neighbors. 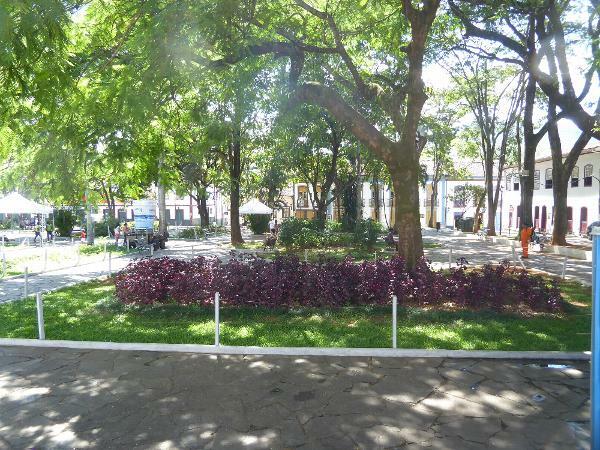 So here's the Praça Tiradentes, the plaza of the "tooth puller." 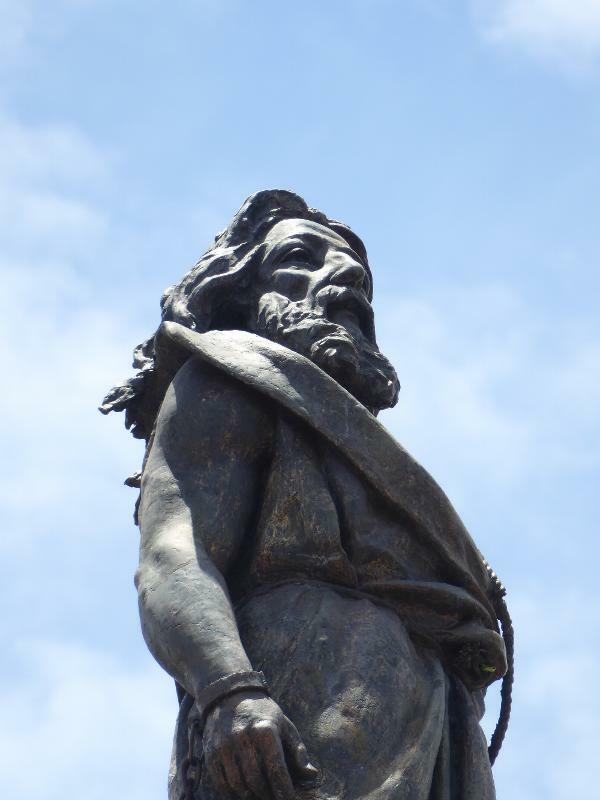 He was Joaquim José da Silva Xavier, hung as a traitor in 1792 for his role as leader of the Inconfidência Mineira. Just to make the point, the government drew and quartered his body, then sent various bits around the country. It worked, sort of: independence was postponed for 30 years, and eventually came in the form of a Brazilian empire ruled by a son of the King of Portugal. 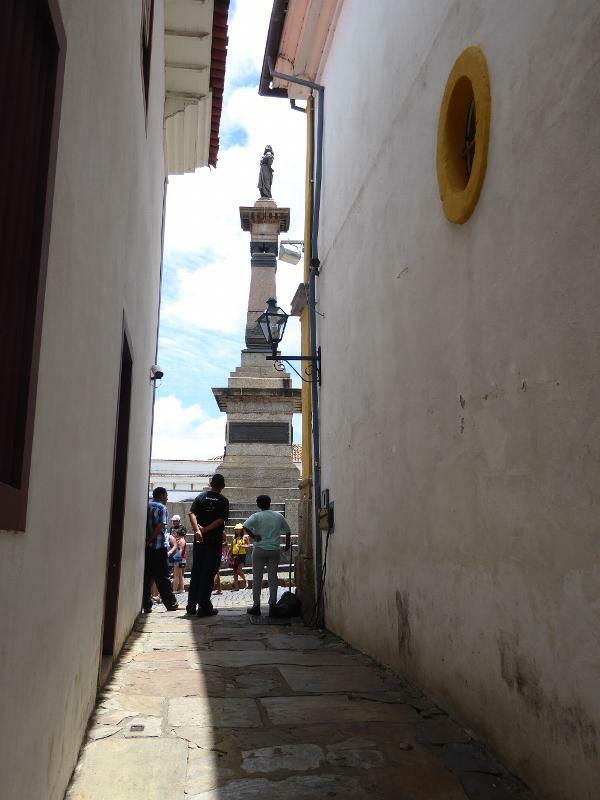 A side street off the plaza: it's the Rua Conde de Bobadela. 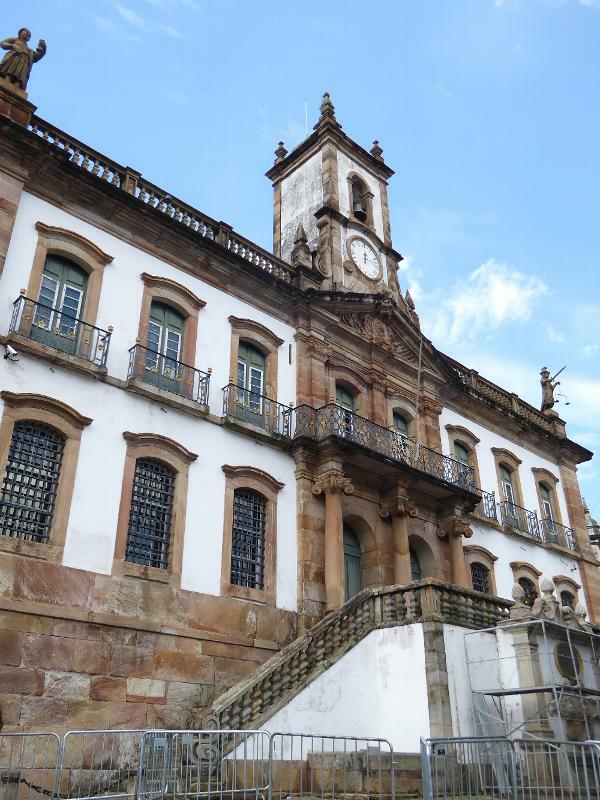 The old town hall and prison is now the Museu de Inconfidencia. 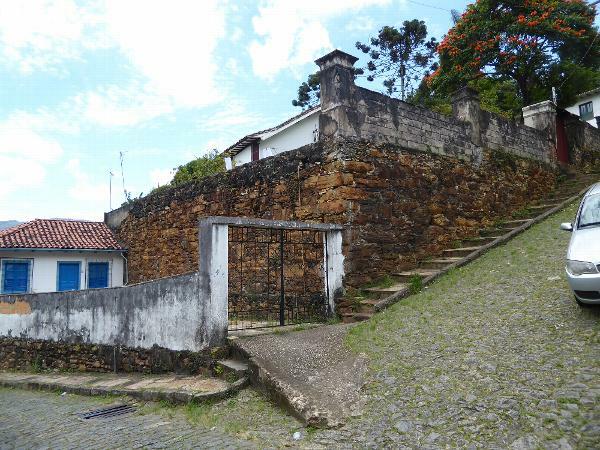 Ironically, it was designed by a governor, Dom Luiz da Cunha e Menezes, whose commandeering of men and equipment to build the place contributed to the uprising led by Tiradentes. The orange sandstone is handsome, and the Herodian blocks are impressive. The ionic capitals are nice, too, though the barred windows are a bit much. 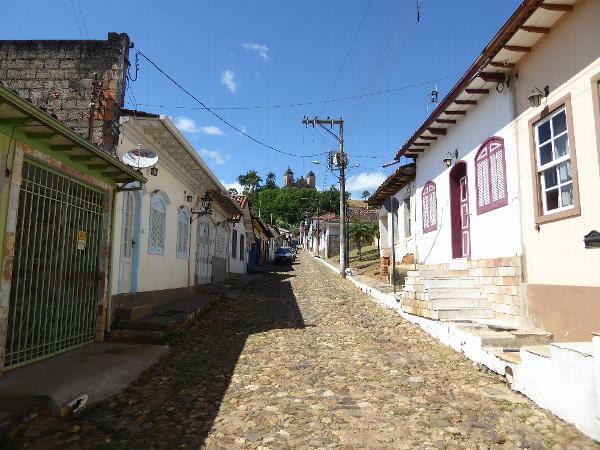 Still, sixty percent of the town's residents were slaves, and most of the rest were mestizos or mulattoes, so Dom Luiz probably knew what he was doing. People of means in Brazil today prefer razor wire and electric fencing. The Carmelite church, locked tight behind a fence also locked tight. The facade is rounded, though it's hard to see the curvature when you're looking straight on. 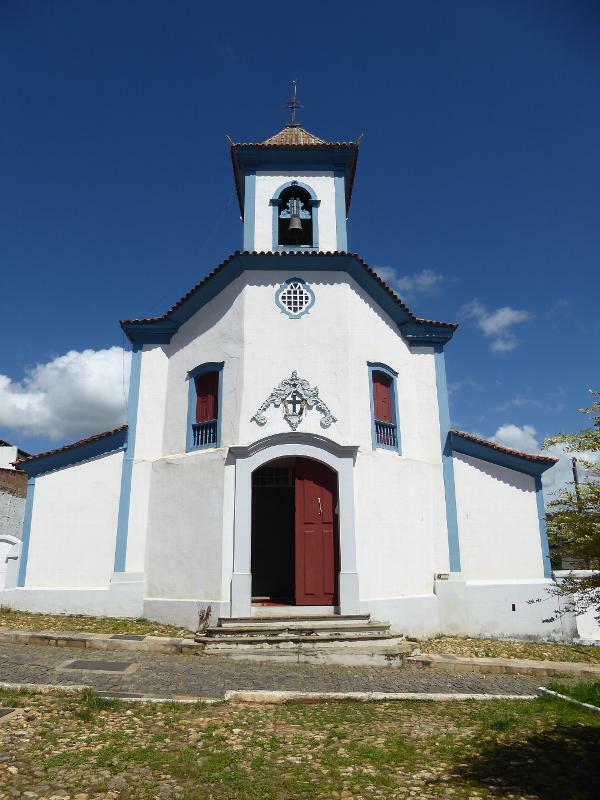 This is another church by a Third Order, that is to say by laymen in lieu of the monks and nuns who, constituting the first and second orders, were barred from Minas. 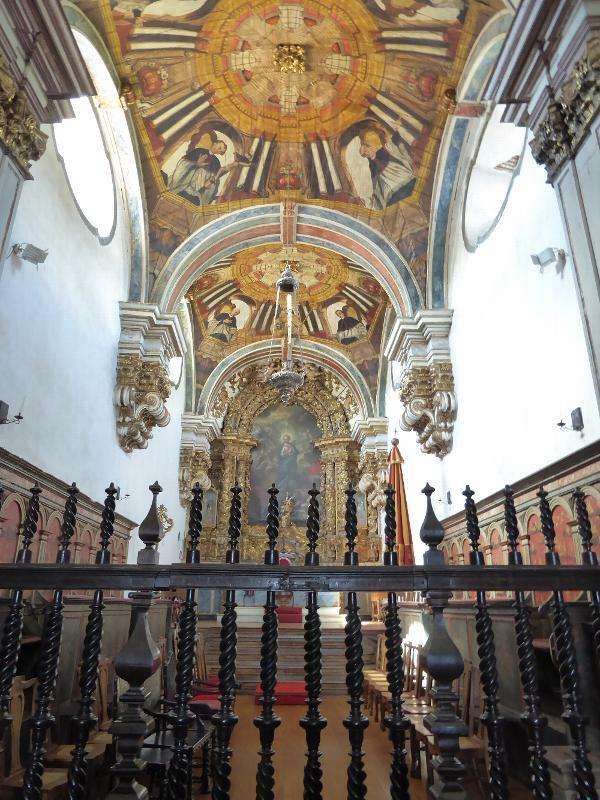 Here's a church built by the Third Order of Francisans. It's open, grand, and obsessively restrictive on the subject of cameras. The sculptures are in soapstone; the one in a bull's eye shows Francis in ecstasy and/or receiving the stigmata. It's by Aleijadinho, the "little cripple," a mulatto who had lost his fingers probably to leprosy and who worked with chisels tied to his wrists. The glorious ceiling was painted by Manuel da Costa Ataide, who along with Aleijadinho ranks as a leading artist of colonial Brazil. The interior space, if one is brutally honest about it, is "a huge box made to house the richly carved altars and pulpits." That's Saint Francis up on the left; this is the church of the Conception. Think it's open? Think again. 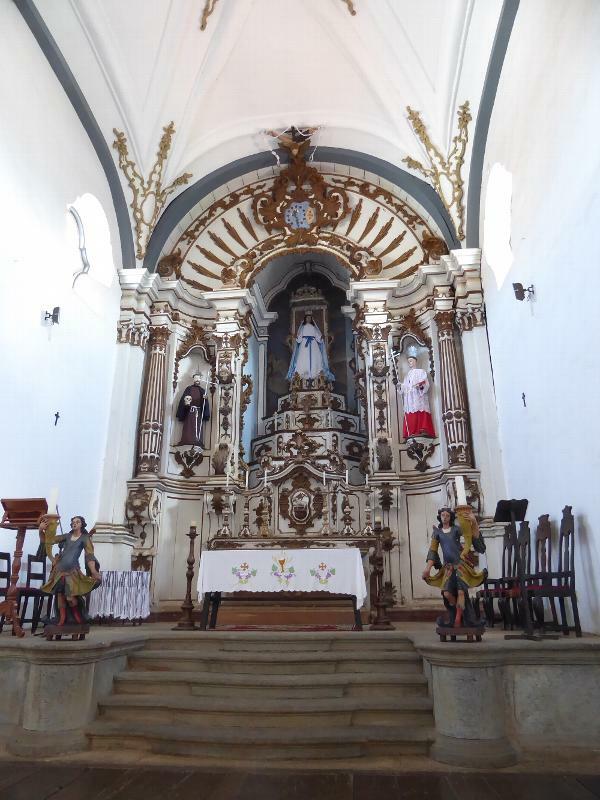 As the bars on the town hall suggest, security in colonial Ouro Preto was an issue for anyone with anything worth stealing, and shrines like this were added to provide a bit of psychological comfort. 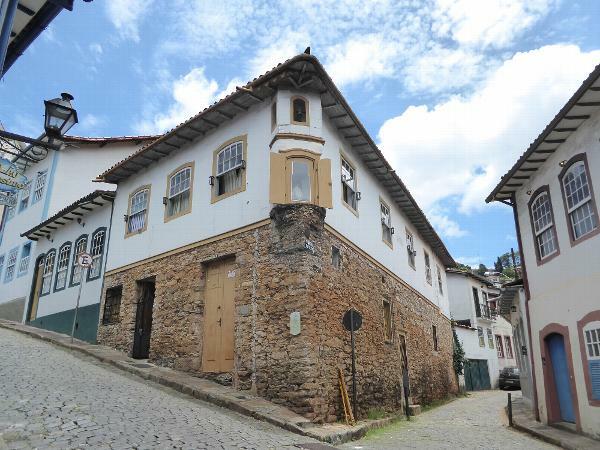 This one's at a corner overlooking Rua Bernardo Vasconcellos. Hey! No parking. Walls helped, too. They're mostly the local orange sandstone. 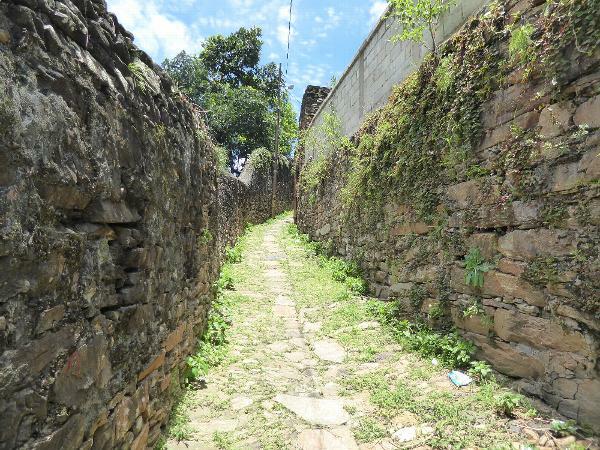 Here's an alley, the Beco do Pilão. Can't see much, though even a lazy burglar wouldn't be seriously deterred. Where does the alley lead? 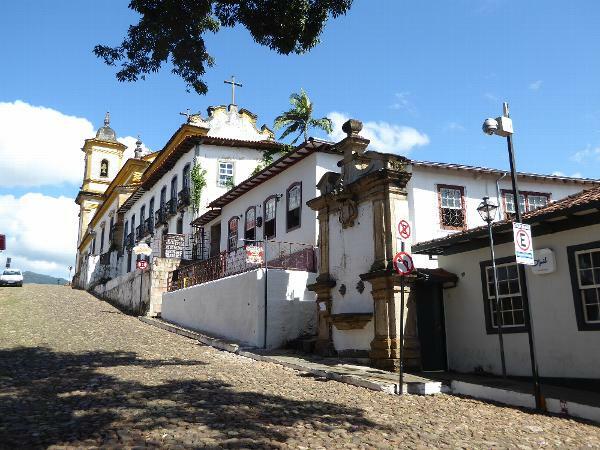 Here, to the Tiradentes monument. Here he stands, as he does in many Brazilian towns. Freedom is a powerful idea.